The EarthScope Transportable Array (TA) is a dense network of state-of-the-art seismic stations that, from 2004-2015, migrated across the contiguous 48 states recording the high-quality data needed to map the structure of the earth beneath North America. The project sponsored by the National Science Foundation (NSF) and deployed by Incorporated Research Institutions for Seismology (IRIS) already has made possible a growing body of significant, peer reviewed science that furthers our understanding of the continent, its formation, and its hazards. The Transportable Array has since moved north to Alaska and western Canada. A few test stations were installed in 2011-2013 before deployment began in earnest in 2014. In all, TA’s Alaska phase comprises 280 stations and will run through 2020. All stations are now in the ground, including 72 cooperating stations from existing networks operated largely by the Alaska Earthquake Center but also including stations operated by Alaska Volcano Observatory, National Tsunami Warning Center, and Canadian Hazard Information Service. The array is a grid of stations spaced about 85km apart covering all of mainland Alaska and parts of the Yukon, British Columbia, and the Northwest Territories (Figure 1). An interactive map of active TA stations is available here. Figure 1: Current TA Footprint. "TA" sites (circles) are new seismic stations, and "Existing" sites are either upgraded (squares) or as-is (triangles) contributing seismic stations. Station locations are available in KMZ and CSV format (version 10/25/2018). There were strong scientific motivations for shifting the TA to Alaska. Alaska is the nation’s most seismically active state, with more large and moderate earthquakes than the rest of the country combined. Furthermore, that seismicity is varied in nature and spread across the entire state (Figure 2), including regions that have never been closely monitored. The pre-TA instrumentation simply was not adequate for investigating the forces at play in many of the state’s far-flung regions. 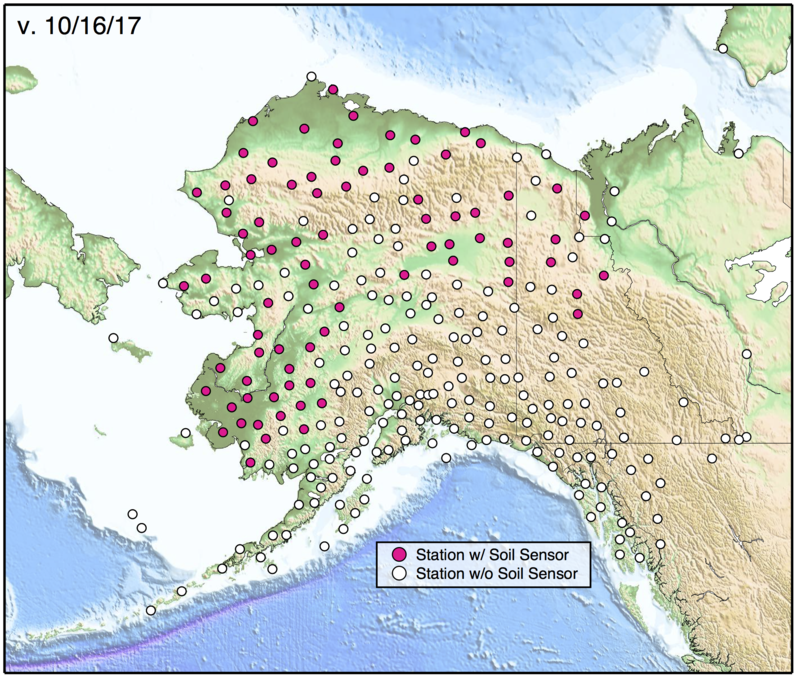 New TA stations have already greatly increased earthquake detections in Southeast Alaska, Southwest Alaska, and the North Slope. As in the contiguous 48 states, this unprecedented station coverage makes possible new research into the structure of the earth beneath Alaska. Figure 2: Seismicity from 1970-2012 for Alaska and vicinity from the Alaska Earthquake Center and USGS PDE catalogs, click for pdf. Figure courtesy of Natalia Ruppert (AEC). 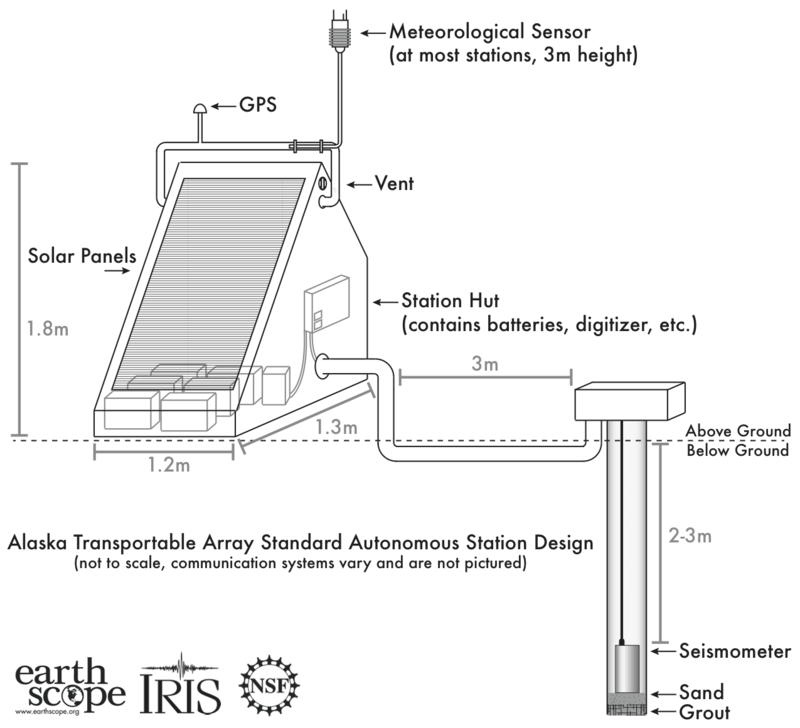 Transportable Array stations are equipped with atmospheric sensors, including barometers and infrasound microphones (Figure 3). Because of the density of the TA network, this atmospheric data is proving valuable for studying weather and atmospheric events in remote, sparsely monitored regions, as well as for wildlfire response. Figure 3: Locations of Meteorological (MET) sensors in the TA. 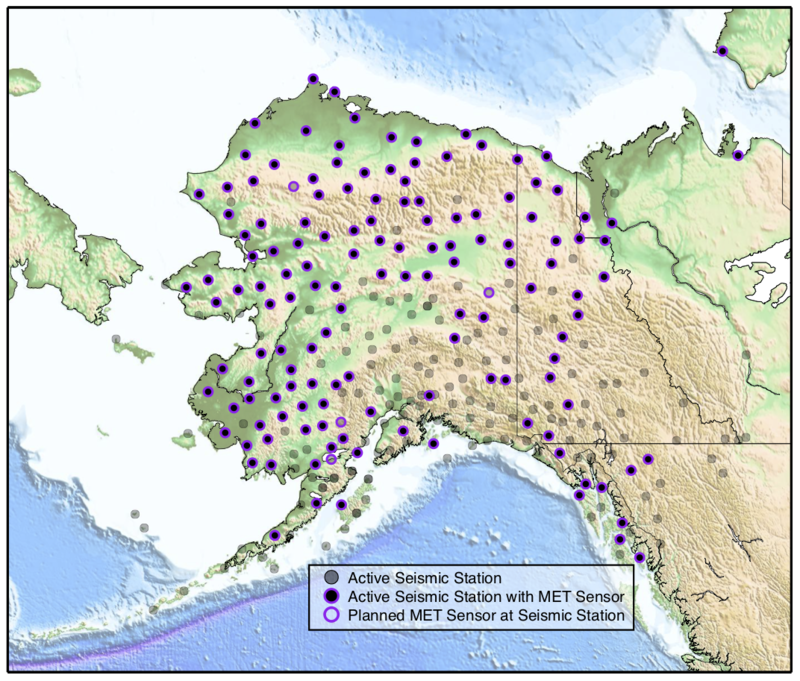 Priority for co-located MET and seismic sensors was given to stations in remote areas that have not had meteorological sensor coverage before. 78 of the TA sites are instrumented with soil temperature profilers, the majority provided by the NASA ABoVE program but also by the Yukon Geological Survey. 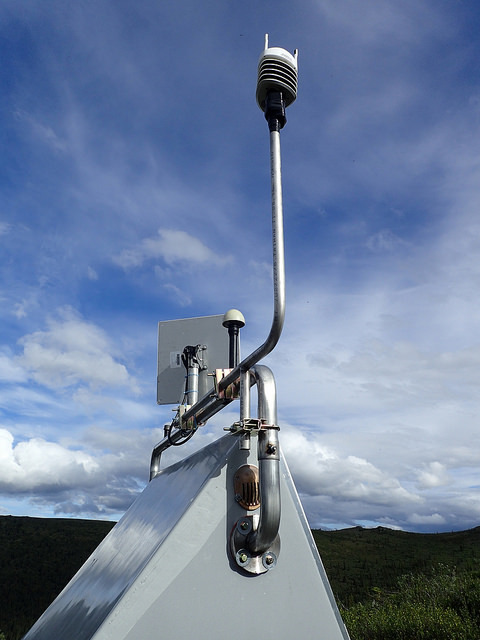 These stations complement an existing temperature monitoring network, allowing for better characterization of ground temperatures and permafrost conditions in northern and western Alaska. Subsurface temperatures depend on many variables, including snow cover, vegetation, terrain, and soil properties. Mean temperatures for a study region may not account for “hot spots” of change, which can significantly contribute to thaw and associated carbon emissions. A solution is to record temperature regimes within different ecotypes in order to build a portfolio of subsurface thermal regimes across various ground conditions. The TA sites are valuable for calibration and validation efforts and for informing thermal regime modeling. More information about this permafrost project can be found here. Transportable Array data is publicly available via the IRIS Data Management Center and is utilized by the USGS National Earthquake Information Center and NOAA Tsunami Warning Center for real-time hazard monitoring. Additionally, many TA stations in the contiguous 48 states were retained as part of the separately funded project, Central and Eastern United States Network (CEUSN). Data from these stations is available from the IRIS Data Management Center with network code N4. Alaska’s climate and geography demanded extensive station redesign to achieve the data return rates required for this project (Figure 4). Installing the sensors far enough underground for optimal data quality required designing a lightweight drill rig that could be flown to the sites by helicopter. Clusters of lithium iron phosphate batteries power the equipment through the long winter and are recharged by solar power systems during the summer. Most of the stations are located in wilderness, far from any telecommunications infrastructure. Near-real-time telemetry is provided by InMarSat BGAN, Iridium, cellular, or direct radio links. With datalogger capacities of up to 64 GB storage, stations can maintain a complete record from 8+ years of deployment. Figure 4: Schematic for an Alaska TA station, click to enlarge. 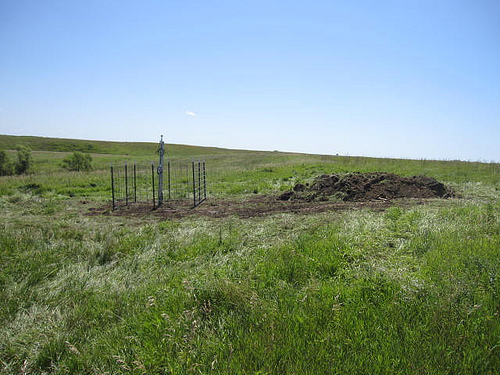 Each TA station’s seismograph system consists of a Quanterra Q330 datalogger connected to a three-component broadband seismometer (T120PH or STS-4B/5A) installed in a 6-inch diameter shallow borehole at a depth of about 2.8 meters. The standard TA atmospheric sensor package includes a MEMS state-of-health barometer, NCPA infrasound sensor, and SETRA microbarograph. Some stations also include a soil temperature profiler. 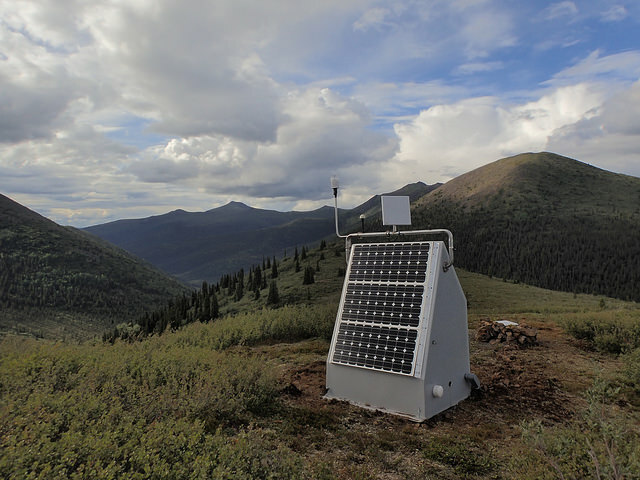 As an example of a typcial Alaska TA station, M29M was constructed and installed in just two days on July 26-27, 2016 along Somme Creek in the Yukon (Figure 5). The seismometer was installed using a down-the-hole hammer to drill a 2.7 meter steel cased hole into an igneous bedrock ridge line. For more photos of installation, see this mid-2017 field season report. Alaska’s TA stations are scheduled to be removed beginning in 2020. Because the Alaska phase has brought stations to active regions of Alaska that were previously unmonitored, efforts are underway to secure funds for incorporating some of these into Alaska’s permanent seismic network. As with the inter-agency-funded CEUSN in the contiguous 48 states, there is broad agreement that TA stations in Alaska represent an important new capability for answering basic geologic questions and evaluating risks to life and infrastructure. Presentations and recommendations from the USArray Sustainability Workshop in 2016 are available at the ARCUS website. Figure 6. Typical Alaska TA station installs were constructed in a single day with a four-person crew plus pilots. The drill and station hut are helicopter portable so that stations can be constructed in very remote regions. The USArray Transportable Array is sponsored by the National Science Foundation. The successful funding of the IRIS SAGE Proposal made possible the TA’s redeployment as a single, static footprint in Alaska and northwestern Canada through 2020. The Transportable Array Advisory Committee (TAAC) advises on the operation and technical performance of the TA in the context of EarthScope's science goals and changes in annual budgets. 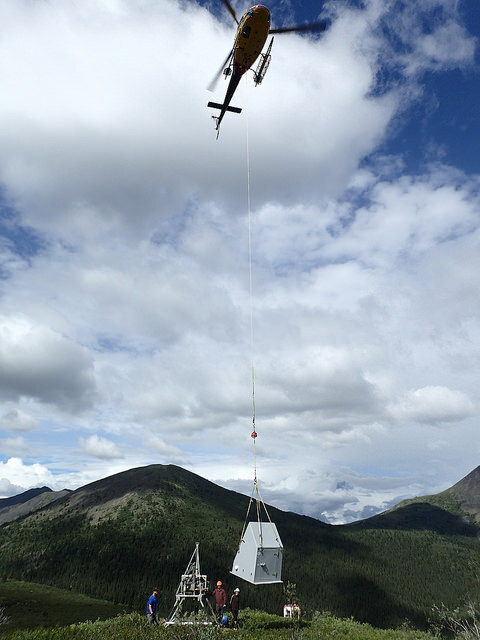 The Alaska deployment of the USArray Transportable Array has cooperation and support from the Alaska Earthquake Center at the Geophysical Institute, University of Alaska Fairbanks. 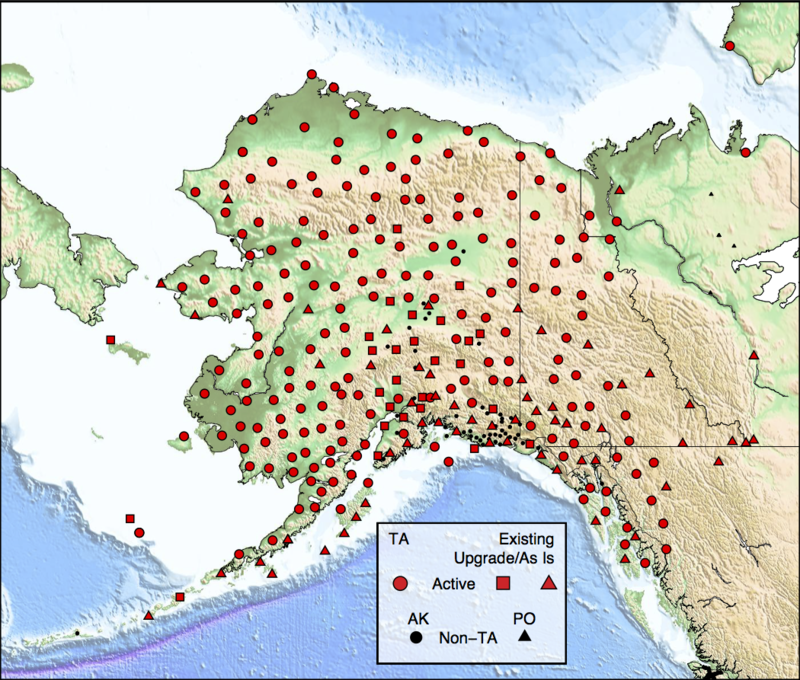 The AEC handles the telemetry and data acquisition for 54 stations in the Alaska TA network. Cooperation with the Canadian Hazards Information Service, Yukon Geological Survey, and Natural Resources Canada has also been vital to extending TA stations across the border. The investment of EarthScope directly benefits other seismic network operators in Alaska, many of which are focused on characterizing seismic, volcanic, and tsunami hazards. IRIS also works with the Alaska Earthquake Center, Alaska Volcano Observatory, and the Alaska Tsunami Warning Center to upgrade and leverage existing seismic infrastructure and permitting wherever possible. IRIS is keen to collaborate with members of the Arctic science community during the development and implementation of USArray in Alaska. Publications related to the Transportable Array in Alaska, including development plans and regional fact sheets, are available online here. The collection of high-quality, telemetered data in remote regions of Alaska is a daunting task only made possible through the collaboration and hard work of many individuals. A list of the staff at the Anchorage Operations Center can be found here. Plafker, G. and Berg, H.C. (1994) An overview of the geology and tectonic evolution of Alaska, in Plafker, G. and Berg, H.C. (Eds. ), The geology of Alaska: Boulder, Colorado, Geol. Soc. of Am., The Geology of North America, v. G1, p. 989-1021. Freymueller, J.T., P.J. Haeussler, R.L. Wesson, and G. Ekstrom (Eds.) 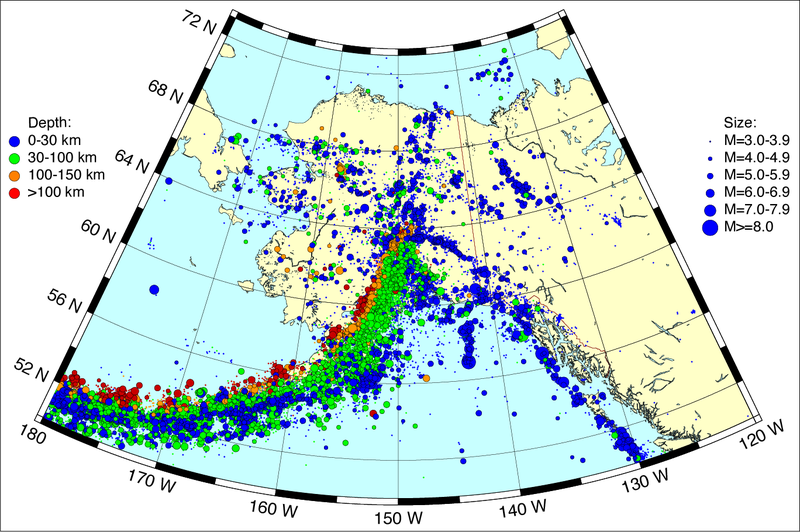 (2008), Active Tectonics and Seismic Potential of Alaska, Geophys. Monogr. Ser., vol. 179, 431 pp., doi:10.1029/GM179, AGU, Washington, D. C.
Wilson, F.H., Hults, C.P., Mull, C.G, and Karl, S.M, comps. (2015) Geologic map of Alaska: U.S. Geological Survey Scientific Investigations Map 3340, pamphlet 196 p., 2 sheets, scale 1:1,584,000.